A pretty bad movie, actually. But what were you expecting? Still, it had the totally cool line "He's in the can draining his lizard." Best Scare: The heroine's father dies in the most awful way in the series history . . . but it's not really scary. I'd Recommend It To: Hey, you know what to expect. See it if you want. 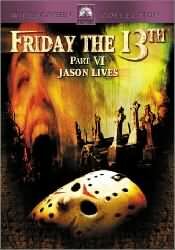 Yes, it is more than a little ridiculous to have Jason come back from the dead in the manner that he does in this one. Other than this point the film isn't half bad. It is actually entertaining in parts. Unfortunately, the star of the show is clearly Jason. There isn't a single sympathetic character to be had in the rest. And by the way, could he just take the chain off?